Yes, yes, I’m not the greatest at updating my blog. As with many fun things, blogging tends to drop off the end of my to-do list but here I am trying to be a bit better at writing these things to keep you up to date with all the creative things I’m up to at the moment. The big news is that the last tracks for my upcoming EP have (finally) been laid down. It’s been about 5 years since I first started thinking about arrangements for the project and I can play a few more instruments now than I could when I started recording. It probably would have been completed a bit sooner had I not been struck with an annoyingly persistent cold in October which I didn’t manage to kick for about three months. 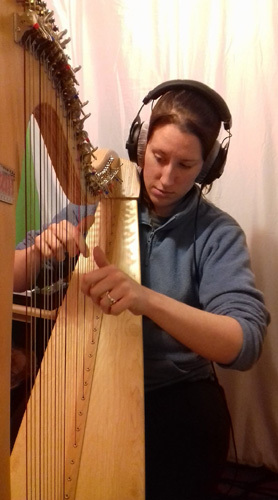 The next part of the process is mixing, mastering and replication; I’m hoping it’ll be out in time for my solo gig at the Swindon Folksingers Club on 22nd June. In addition to the EP, I’ve begun a new creative project which will feature not only new songs but also stories written by me. The project is called The Limbo Teahouse; I guess the genre could be considered fantasy/historical so if you’re into that sort of thing then why not check out the free piece up there to get a feel for the setting and then – if you’d like – why not consider becoming one of my patrons. You can find my Patreon page here: https://www.patreon.com/chantellesmith. I’ve also been taking part in TradSongTues over on Twitter; like FolkloreThursday, TradSongTues encourages followers to share folk songs on a specific theme for the week. I’ve mostly tweeted songs from the Ballads in the Borders and Beyond project but I have recorded a couple of new ones. Here’s ‘Virginia’ which I learned specifically for TradSongTues as I didn’t have any songs about transportation. Last but not least, I’ll be performing at Hammerman Day 2018 at the Beehive pub in Swindon on the evening of the 8th April. Hammerman Day is a celebration of author, poet and folk song collector Alfred Williams.